Sun Cellular is giving you more ways to enjoy on being a postpaid subscriber, aside from their affordable plan offers you can also get their Sulit Mobile internet rate. In addition to their browsing promo, postpaid users can now apply on PowerUP Add-on mobile internet where you can save up to 72% when you consider this additional service. You’re given an option to choose how many browsing hours you want to add up on your current plan, from 20 hours, 60 hours to unlimited. You'll get a 20 hours mobile internet add-on for only 149 pesos valid for 30 days. This gives you P7.50 per hour rate, much cheaper that the usual standard and per hour browsing rate. Pay for only 399 pesos while browsing up to 60 hours using you mobile phone. 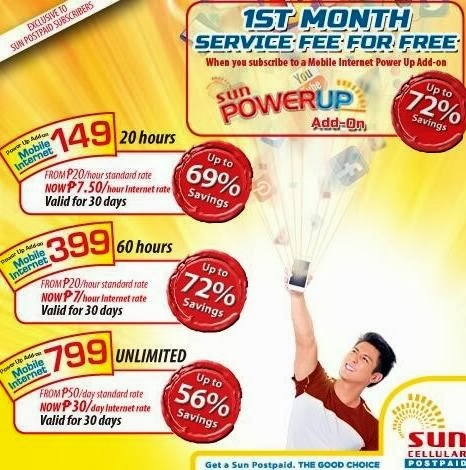 Get more than what you pay for with this add-on instead of paying P1000 plus for 20 pesos per hour rate or 900 for 15 pesos per hour surfing you only pay 399 pesos with Sun Power Up add-on. Here's more for this promo, instead of paying 999 pesos on usual unli data plan with Power Up 799 you only pay 799 pesos for unlimited internet service using you phone or broadband. You can also connect other device via hotspot or make use of pocket wifi to share you internet connection. This promo is available only to all Sun Postpaid subscribers who want to add up a data plan on top of their current enrolled contract. For more details visit your nearest Sun Shop.